The area around Natya is part of the Eastern Mallee and consists of gently rolling sandhills, loam flats, with occasional outcroppings of limestone. The larger vegetation was principally Dumosa Mallee, but there was a lot of Hop Bush as well, and a few Mallee Pines. The limestone became important in the building of the homestead on our property in about 1919, when Mr Mann, with the assistance of a talented working man, who was a builder, decided to build his house from burnt lime, mined and treated on the property. The walls were nearly one and a half feet thick, and the house was cool in Summer and very long lasting. It is still standing today, uninhabited now because of white ant damage to the floors. The soil was deemed suitable for wheat growing, so after the 1st World War soldier settlers were offered blocks in the locality. The Mallee trees had to be rolled and burnt prior to the wheat growing beginning, but when established great crops were produced, even without superphosphate, and everyone believed that they were on the doorstep of a golden era. But of course the soil lost its productivity with the passing of time and eventually, a string of droughts finished the glory years. The land was ploughed with a Stump Jump Mouldboard plough and then scarified with a combine, before being sown with wheat seed and superphosphate. I think my Father favoured Ben Cubbin Federation and Olympic seed for various reasons. I can just remember my Dad using the Stripper which took the grain head off whole, and then it had to be thrashed. The stripper was really not suitable for the Mallee as it was too heavy to pull through the sand, so Dad bought a Sunshine Big E Harvester as soon as he could afford it and this was a big step forward. Later on he was to purchase a Header and in 1951 he became the possessor of a big Auto header. This was in the Ultima district because he'd sold the Natya property to Vic Wilkins by then. Dad used the ten horse team, yoked tandem five and five most of the time when harvesting, scarifying, stripping etc. and used reduced numbers when doing different jobs such as cleaning out dams with the Box Scoop or channel cleaning with the Wonky Scoop. He would use six to eight horses yoked in pairs to pull the Box Wagon depending on the weight of the load. When I got older I was able to take a load of bagged wheat into Natya on the flat-topped, rubber tyred wagon called a Runner, where it would be weighed, tested and unloaded by the wheat lumper and I could go back for another load. Not very big loads, only about a ton, which is twelve bags, and pulled by two horses. We all helped by hand sewing the bags of wheat, although Dad had to usually do the filling and ramming. We were required to do a good job, twenty-two stitches, so as the wheat wouldn't leak out and be lost. Chaff was necessary for feeding the horses as they needed hard feed when they worked hard. We didn't help when the chaff was being cut as it was deemed a dangerous procedure, even though we thought we should be able to be allowed to pitch down the sheaves from the stack or be permitted to stitch up the bags, only six to eight stitches in bags of chaff. The oats were cut with a Binder, and they were formed into sheaves, then later had to be put into a stook to dry. Later they were pitched up onto the wagon and then carted to the site where the stack builder was going to build. This was a fairly specialised job. We also helped our Father with Lamb marking and crutching, and helped with mustering for the crutching and shearing, and counting the tails in lamb marking, giving a hand at drafting, raddling etc. The Natya School was one and a half miles away so when I began there in 1934 I rode old "Paddy", a flea-bitten grey pony. My sister Betty joined me even though she was a bit young for school. "Paddy" was an annoying horse because he had to be forced to go to school, and very reluctantly shuffled along, dragging his back feet, partly wearing out his hooves. But if my Father took him to a Gymkhana "Paddy" looked and behaved like an Arab arching his neck and stepping high, looking full of enthusiasm. "Paddy" also annoyed us by stopping and turning his tail to the rain shower, or a dust storm, or and then just standing there paying no attention to our threats. He also would stop and scratch his belly on a "Wait-a-while" bush, a type of prickly native Grevillia. And of course, all this would make us late for school. And pupils who were late for school were punished with the strap. We just accepted this as part of life. But I had a very poor opinion of the teacher and did all I could in later life, when I became a school teacher, to exclude all aspects of injustice from my classes. Our school was a typical rural one teacher school, made of weatherboard, and similar to hundreds allover the country Victoria, New South Wales and Queensland, and were a means of educating the children of the early settlers, the railway workers, the fencers, the trappers and the stockmen etc. This system of education was very successful, and much of the credit goes to the school teachers of that era who were very dedicated and versatile, having to teach a variety of students in all grades. These schools were situated about five or six miles apart, as that was the distance the authorities reasoned a child could walk, maximum distance a child could walk to school. The school was about twenty-five feet by twenty-three feet and had a fireplace in the middle of the West wall, and a blackboard on either side of that. The blackboard was really the only aid that the teacher had and was very well used. A Mallee stump fire burned in a fireplace in the cold winter days, and we used to toast our sandwiches on the coals, and the teacher would heat milk for cocoa to warm our tummies at dinner time. The school was hot in Summer, and we had tank water in a verandah bag for a cool drink. When I was young my Father played cricket with the local Natya team and we would go along to watch, but mostly to play with the other children. We played cricket at school and it wasn't long before I became addicted and went with my Father, when permitted, when Natya played against the other teams, for example, Bungunyah, Tooleybuc, Koraleigh, Border, Piangil and Nyah. Then my Father took me to see Bradman play at the Melbourne Cricket Ground against the England Team in the Summer of 1937 when I was nine years old, and the day remains clearly in my memory as a very special event. Over the years I've listened to cricket broadcasts on radio to every match possible, and being able now to sit and watch the cricket on TV is the best part of retirement. My parents also took us to the Murray River for picnics and for swimming practice, when Dad had temporarily fenced a sandbar with cyclone, so that we were safe. My sister Betty became a very good swimmer with a Bronze Medallion, and a very good diver. I began playing tennis when I was about eight as both my parents played, and us kids would pick up a racquet at every opportunity. There were two courts near the railway line, and then they built three new ones near the Hall. I remember my Father helping at the "working bee" to grade the land. We played tennis matches against Natya West School but they always beat us as they were very good players, and they had a good tennis playing teacher, Vern Pascoe, who was very good, and very enthusiastic, and he got the plans to build a court, and that started them off. I won my first tennis tournament when I was eleven, and only won because I was partnered by August Engstrom, a top player from Natya West. We beat Frank Wade and Lily Lawry in the final, and I still have the cut glass, crystal powder bowl that I was given for my trophy. Then I started to ride "Bluey" to the tennis courts on a Sunday afternoon, and after Church we'd practice, or join the tournament when I got older. It was a great sport and I loved the social side as well as the competitive aspect, and I was very sorry when I had to give it up as my hip wouldn't carry me any more. 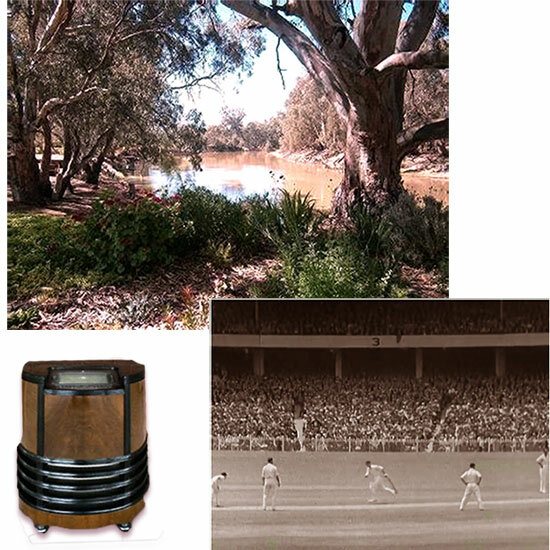 I think it was about 1936 that our parents bought the wireless, and that was the greatest thing, bringing in contact and news of the area and other parts of Australia and overseas into our home. They bought the Console type wireless from Bill Cornish who was the first one to stock and repair radios in Swan Hill. And Bill was prominent in the beginning of Radio 3SH in Swan Hill. The Console was really a piece of attractive furniture, being about three foot tall of polished Walnut wood. It was a Stromberg Carlson and used with batteries, which meant that you saved the batteries by listening only to important programs, for example, The News, and maybe early evening serials such as "Dad and Dave" or "Martin's Corner" or "Mittens". Mum always enjoyed listening to "The Lux Theatre" of a Sunday night, and Dad liked to listen to the cricket. The battery had to be taken to Piangil to be recharged so you had two, one in use and one getting charged. And taking it to Piangil was not an easy procedure. Ten miles of sandy roads in the gig, or later on by truck when Dad bought a 1928 Chev. for carrying stumps and wool etc. Nobody left the wireless on for background music, it was too wasteful on the battery. I'm very grateful that I've been able to spend most of my life in the Mallee as this is a great place. Such a wonderful place of great people, good friends, fresh air and sunshine. It is also a place which is tough and moulds character. You don't conquer the Mallee, you live with it, and try and keep your head and your spirit up. I'm very grateful to my parents for many things. They gave me a great family, a great life, and a good education, and I know they had to do without, to go without to do the last one. They gave me a lot of the important things, and not so much of the lesser things. They gave me a lot of love, happiness, opportunity and understanding, and very little of some material things, for these we had to work, and thus appreciate them so much more. For example, every time I look at my green lawn I value it immensely when the only lawn I saw as a child was the whiskery clumps of couch grass by the dam. And water is so precious and so wonderful that I never tire of admiring it.